To be truthful, there was not enough space in a villager’s house for a kitchen as large as the one shown above. 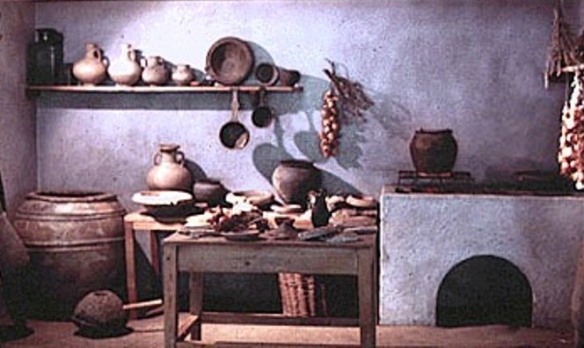 This kitchen would have been found in one of the richer houses of the period – not in a simple village like Nazareth. 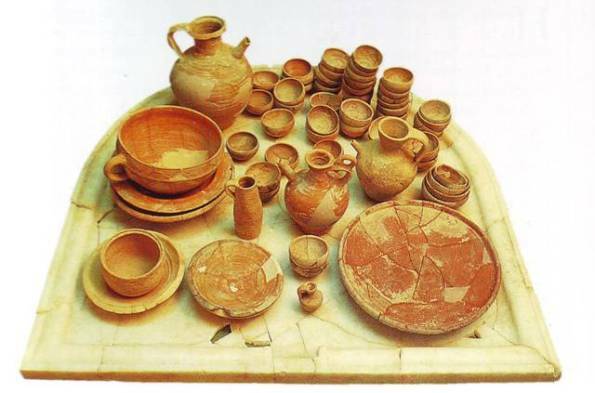 The house of Mary and Joseph’s family would have had a simpler cooking area, perhaps a circle of stones with a fire at the center, or a small bread oven. It was in the main room of the house – along with the sleeping and eating areas. Cupboards were unnecessary, because small niches were cut into the walls – storage space for bed rolls, clothes, small items of food, etc. 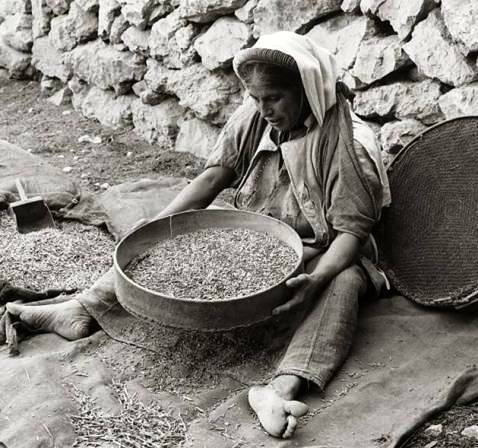 But grain or oil for cooking was kept in a separate storage area. There was also space for animals and their food-troughs, called mangers. 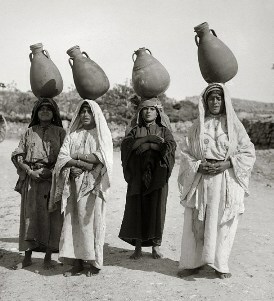 Twice a day, in the cool of the morning and in the evening, women took large earthenware pitchers to the village well, where they pulled the water up with a leather bucket on the end of a rope. This was the time of day when they talked with their friends, waiting to draw water. Meals were simple but wholesome. 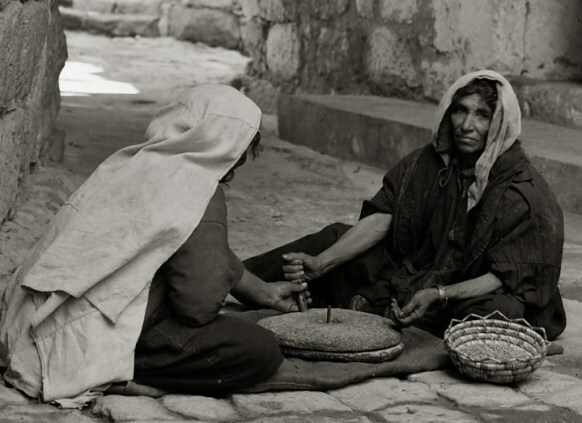 Bread, usually barley bread, was a feature of every meal, and women made it as often as needed. In summer, they probably baked several days’ supply at a time, to cut down on the discomfort caused by the heat of their oven. 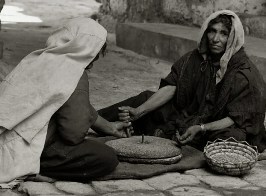 Grain for bread was ground by the women on two grinding stones, the lower one fixed, the upper one rotating (see photograph at right and enlargement below). The grain was mixed with water, and then fermented dough, kept for this purpose, was kneaded into the dough, which was left to rise. Then the thin, flat circles of dough were slapped onto the hot stones in the fire, or placed in a bread oven if the family had one. 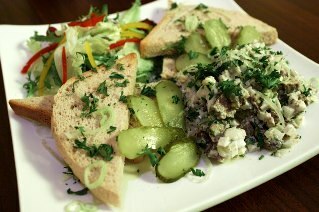 The main meal was eaten in the evening. It might consist of a lentil stew seasoned with herbs like cumin, black cumin or coriander. 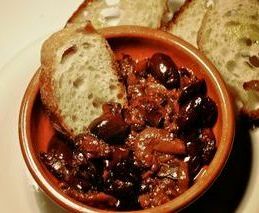 It was served with cheese made from sheep or goats’ milk, olives, onions and bread. Fruits included fresh figs and melon, as well as dried pomegranates and dates – dried fruits were a staple item in the Middle East. Wine, water and curdled milk, similar to liquid yogurt, accompanied the meal. Sugar? Unheard of, so most people had healthy teeth. Honey was used as a sweetener, but only occasionally and usually by the wealthy. Meat was a rarity, kept for special occasions. Fish was much more common, and the dried fish industry was an important source of wealth for the people around the Sea of Galilee. The town of Magdala, not far from Nazareth, was a center of the dried fish industry, and Mary Magdalene may have earned her money from dried fish rather than prostitution – see Did Jesus Marry Mary Magdalene? The ravines in the slopes and the rocky ground were suitable for clusters of trees whose olives were gathered, crusted with large grinding stones, pitted, and pressed for oil. The fields on the slopes could grow various grains – wheat, barley, and millet whose chaff was separated on threshing floors with winnowing. The alluvial soil south of the village was sufficiently fertile for vegetables and legumes. Terraces built and irrigated along the steeper slopes maximized the grain harvest and could also support fig and pomegranate trees. An adequate water source was located at the western edge of the village, now called the Well of the Virgin, and it trickles along the length of the village, giving people the ability to grow their own food in small patches of ground. 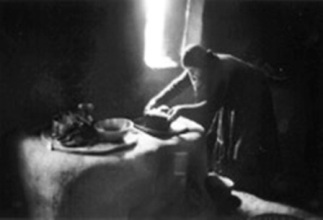 The home was important in Jewish religion. In our society, people associate prayer with a church. In the Jewish religion, both the home and the synagogue were places of prayer. A rabbi or scholar was in charge of prayer in the synagogue, but in the home each individual woman in charge of a household was responsible for the prayer-services held in that home. This was how Mary and Joseph of Nazareth lived. Jewish women prepared all the family’s food. In doing so, they played an important part in maintaining the ‘Jewishness’ of the family. 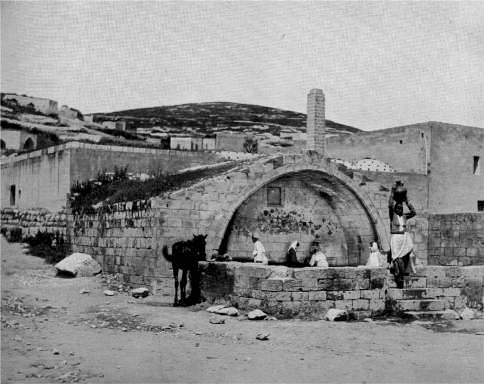 Mary of Nazareth almost certain kept a ‘kosher’ kitchen. This meant the kitchen itself, and each item of food, was ‘proper’ for a Jewish family. Certain foods were (and are) permitted to Jews; others were not. These were not arbitrary choices. Each of the forbidden foods had the potential to carry disease, or be dangerous in some way to anyone who ate it. As a devout Jewish family, Mary and Joseph carefully observed the dietary laws of Judaism. According to Matthew, it was Joseph who chose the name of the child. Names were much more important in that culture than in ours. They were meant to point to the actual character and destiny of the child, and so a great deal of thought went into selecting the right name. ‘Jesus’ is the Greek form of the Hebrew Joshua, ‘the Lord saves’. Joshua was the heroic warrior who led the Hebrews into the Promised Land after Moses died. To the first Christians, Jesus was the prophet who would save them and lead them into a different, heavenly Promised Land. Naming a child had an another function: it was a way of claiming a child as your own. When Joseph named Jesus, he was establishing Jesus’ Davidic lineage through his own ancestry – which makes Joseph very significant in the story of Jesus. 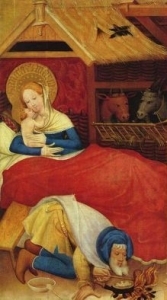 Mary would not have been alone when she gave birth to Jesus, as pious legend likes to picture her. Even if she was travelling and not at home, she would have been helped by a number of women, some from her own family. It was rare for a husband and wife to travel alone together, without any family members around them, and it seems most unlikely in the case of a heavily pregnant woman like Mary. Luke’s gospel makes a point of saying that ‘there was no room for them at the inn’, so the birth probably happened in one of the storage caves hollowed out of the rock near each house. Imagine an over-crowded Palestinian peasant house: a single-roomed home with an animal stall under the same roof. Jesus was placed in one of the animals’ feeding troughs. A question sometimes asked is: what happened to the placenta? In modern Jewish tradition, the placenta is buried as soon as possible after the birth of the child. Since the Jewish purity laws and rituals today are much the same as they were then, it is safe to assume that something similar happened at the birth of Jesus. The midwives would have taken the placenta, dug a hole outside the boundary of the village, and buried it. No-one really knows the date that Jesus was born. The early Christian church named the shortest day of the year as his birthday: after that, each succeeding day becomes lighter and longer. The implication was that the birth of Christ brought light and life into the world. There are two descriptions of the birth of Jesus. 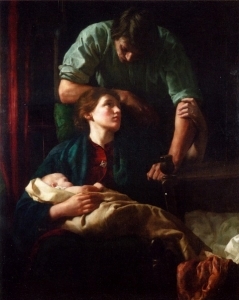 Matthew focuses on Joseph, Luke on Mary. Matthew 1:18-25 18 Now the birth of Jesus Christ took place in this way. When his mother Mary had been betrothed to Joseph, before they came together she was found to be with child of the Holy Spirit; 19and her husband Joseph, being a just man and unwilling to put her to shame, resolved to divorce her quietly. 20 But as he considered this, behold, an angel of the Lord appeared to him in a dream, saying, “Joseph, son of David, do not fear to take Mary your wife, for that which is conceived in her is of the Holy Spirit; 21 she will bear a son, and you shall call his name Jesus, for he will save his people from their sins.” 22 All this took place to fulfil what the Lord had spoken by the prophet: 23 “Behold, a virgin shall conceive and bear a son, and his name shall be called Emmanuel” (which means, God with us). 24When Joseph woke from sleep, he did as the angel of the Lord commanded him; he took his wife, 25 but knew her not until she had borne a son; and he called his name Jesus. Luke 2:1-7 1 In those days a decree went out from Caesar Augustus that all the world should be enrolled. 2 This was the first enrolment, when Quirinius was governor of Syria. 3 And all went to be enrolled, each to his own city. 4 And Joseph also went up from Galilee, from the city of Nazareth, to Judea, to the city of David, which is called Bethlehem, because he was of the house and lineage of David, 5 to be enrolled with Mary, his betrothed, who was with child. 6 And while they were there, the time came for her to be delivered. 7And she gave birth to her first-born son and wrapped him in swaddling cloths, and laid him in a manger, because there was no place for them in the inn.